Spring is here! Soon I’ll be overdosing on asparagus and peas and all those spring vegetables that I’ve been missing for months. It’s finally starting to warm up. And warm weather means salads. Green salads, somnology vegetable salads, disinfection grain salads and, my favorite, cold noodle salads. This particular salad is something I could eat every week. The noodles are slick with sesame oil, soy sauce and rice vinegar – toasty and tangy. 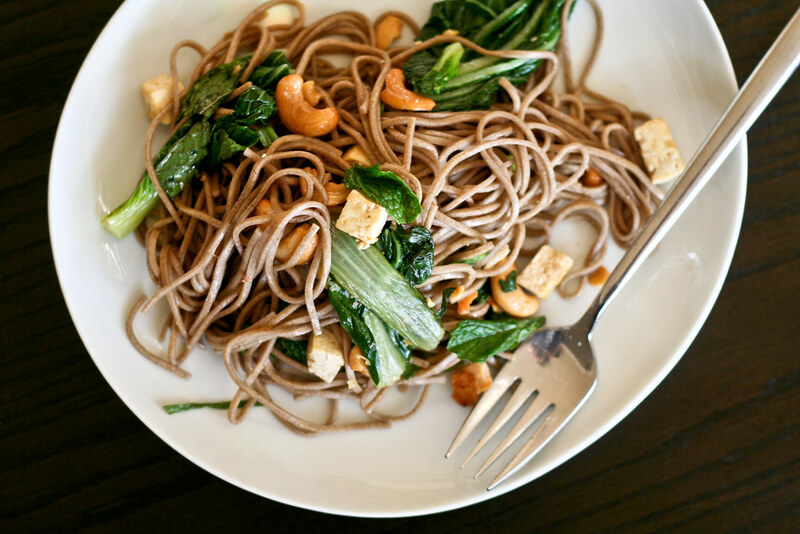 Baby bok choy is sauteed with garlic, cashews and tofu (chicken or steak if you prefer). Everything is tossed together with fresh garlic chives and mint leaves. It’s a delightfully refreshing salad that you can eat again and again. It just tastes like warm weather and sunshine to me. Hello, Spring! Whisk together the sesame oil, shoyu and rice vinegar in a bowl, then stir in the garlic chives and mint leaves. Set aside. Cook the soba noodles until just al dente, then remove to a colander. Rinse with cold water to stop the cooking, then drain thoroughly. Set aside. Set a large skillet over medium-high heat. Once it’s hot, heat the tablespoon of sesame oil, then saute the bok choy and garlic until the garlic just begins to turn golden. Add the tofu and cashews and continue to cook for an additional 5 – 8 minutes or until the tofu begins to brown a bit. Use a spatula to keep moving everything around the skillet so that the tofu doesn’t stick. Toss the noodles with the dressing and contents of the skillet. PS. love the new layout!! Hey Mel, looks great! Why the brown rice vinegar? what’s the difference between that and regular rice vinegar.. just curious. I’ll try this one either way! Wow, they make brown rice vinegar? I’ve never heard of it, but it sounds yummy! I love cold soba noodle salads. Great recipe! 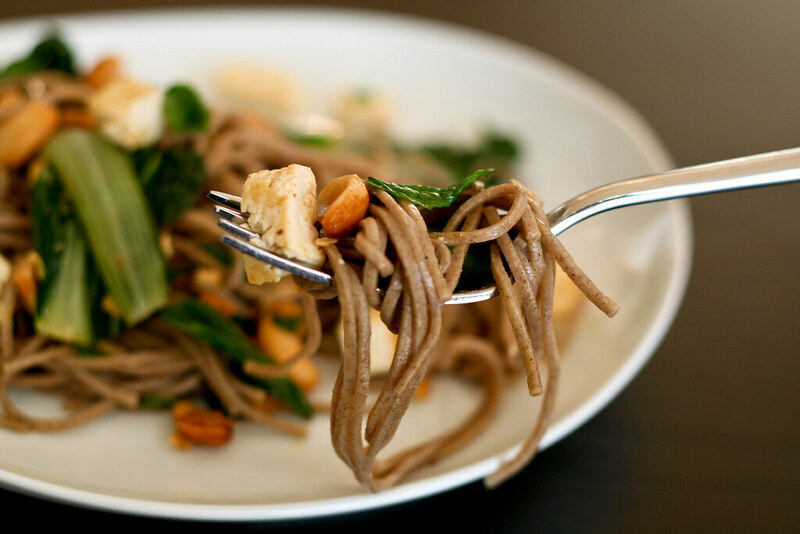 Love that kind of salad with soba noodles! I make one with peanuts and green onions but this one sounds even better! Oh my that sounds fantastic! I’m so excited about how all of these wonderful spring veggies are being showcased! I made something similar to this yesterday using angel hair pasta. The soba noodles would be healthier! Pingback: How do i make a regular rc car go faster? Love love love this! However, when I pulled the leftovers from the fridge the next day, the soba had gotten all starchy and kind of yucky in consistency. Any tips on how avoid that or if I did something wrong? On day one, it was all delicious. I could eat it every day.